The role of empathy in mentoring relationships has been identified in previous research, however the topic has not been thoroughly explored. Mentoring is defined as a caring, trusting and supportive relationship between a young person and a non-parental adult that provides guidance, support and encouragement to the mentee (Rhodes, Spencer, Keller, Liang and Noam, 2006; Schwartz, Lowe and Rhodes, 2012). Empathy is defined as ‘‘understanding others and this understanding includes the other’s thoughts, feelings, desires, beliefs, situation, perspective or experiences’’ (Pamuckcu and Meydan, 2010, p.906). Mentoring with young people can have many benefits including social skills building, interpersonal competence, reduced aggressiveness, improved healing from child abuse or trauma, and enhanced helping, cooperation and generous behaviour (Carlo and Roesch, 2004; Block-Lerner, Adair, Plumb, Rhatigan and Orsillo; Block-Lerner et al., 2007; Laible, Wagaman, 2011). Research has found, however, that empathy is needed for the positive developmental outcomes of mentoring to be achieved (Rhodes, 2002; Spencer, 2006). Successful mentoring relationships have been described as being mutual, trustworthy and empathetic relationships (Grossman and Rhodes, 2002). Empathy and social support are two separate constructs, but share conceptual and practical similarities. Social support is a complex concept; to define it and fully understand it can be a challenge (Dolan and Brady, 2012). For the purposes of this secondary data analysis, Cutrona’s (1996) definition was selected as ‘‘acts that demonstrate responsivity to others’ needs’’ (Cutrona, 1996, p. 17), while empathy was defined as ‘‘understanding others and this understanding includes the other’s thoughts, feelings, desires, beliefs, situation, perspective, or experiences’’ (Pamukcu and Meydan, 2010, p. 906). Both concepts involve the capacity to be responsive to and understanding of others, including their needs, thoughts, feelings, beliefs, desires, and views. Social support goes further, however, requiring an active role or action, whereas empathy may passive or active. For this research, passive empathy will be defined as the ability to sympathise with the emotional states of others but not taking any action to relieve the person in distress. Active empathy refers to affective reactions and actions towards the person in distress or need. This article is based on the qualitative findings which make up part of a larger mixed-methods secondary analysis focused on exploring the role of empathy in youth mentoring relationships between adult mentors and young mentees. Data for this secondary data analysis originated from the Big Brother Big Sister (BBBS) of Ireland Evaluation Study (Dolan, Brady, O’Regan, Canavan, Russell and Forkan, 2011) undertaken by the UNESCO Child and Family Research Centre, NUI Galway. NUI Galway Research Ethics Committee fully approved this study. The aim of this research piece is to identify the role of mentoring relationships in adolescent empathy. This qualitative study consists of nine longitudinal qualitative case studies of mentoring pairs, including the views of young people, mentors, mothers, and case workers. All of these were carried out in the original Big Brothers Big Sisters evaluation study. Original transcripts were fully analysed for this study. Young people in this study had an average age of 12, and five were male. Issues and needs in the overall research sample were economic disadvantage, poor social skills, shyness, and withdrawal. The average time of the match at Time 1 was 5.2 months, the average length of the match at Time 2 was 12.7 months. Content analysis is a systematic method to quantify phenomena by turning words into content related categories to build up a conceptual model or system (Elo and Kyngas, 2007) focusing on the context and meaning of the text (Hsieh and Shannon, 2005). This study applied deductive content analysis specifically, in which the analysis is operationalised on the basis of previous knowledge and its purpose is theory testing (Elo and Kyngas, 2007). The concepts of passive and active empathy in this study informed the analysis. Additionally, the frequency of coded categories is quantified to identify more clearly active and passive expression of empathy in the interviews (Mayring, 2000). A secondary content analysis was carried out to identify the role of empathy in youth mentoring relationships. Interview manuscripts were analysed to find evidence of the empathy, both active social empathy and passive empathy over time. Interviews were analysed by group to explore their views and references of empathy in more detail. 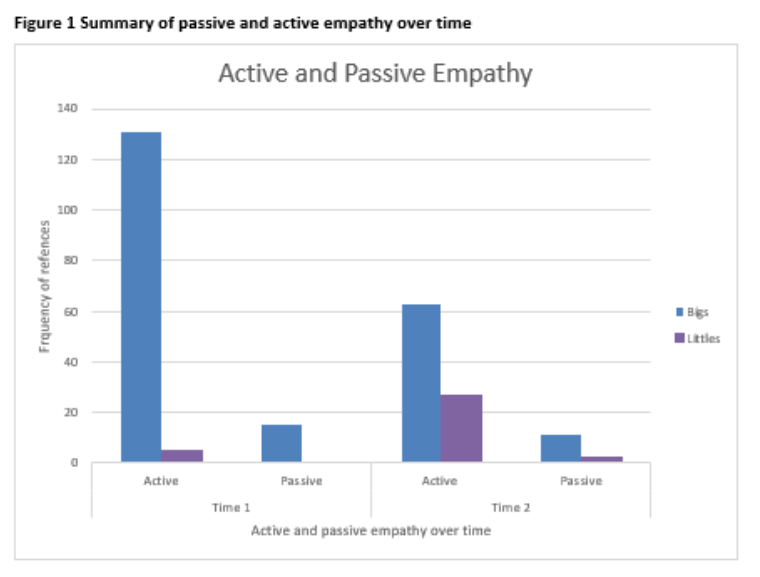 The number of specific references to passive and active empathy verbs were quantified for mentors and mentees to identify emerging patterns over time specifically in the mentoring pairs. Overall, the findings suggest that empathy plays a crucial role in mentoring relationships, serving as the motivation for Big Brothers and Sisters to engage with the programme. For young people, empathy appears to be an outcome of their experience in the programme and also facilitates other processes that sustain the mentoring relationship over time, including building friendship and reciprocal understanding. I thought at the start oh God, he’ll have troubles. I think people do have an idea that it’s for troubled kids, I kind of had that idea at the start and I think people are asking me is he disadvantaged or whatever you know…. Over time, the anonymous ‘child in need’ changed when Bigs had to ‘let go’ of their initial perception of a child and make conscious decisions to avoid judgement and preconceived ideas of the mentored child (Little) and their families: ‘‘I like to reinforce his positive aspects (...) I just try not to judge him on it’’. However, one Big Brother was very opinionated about Little’s parents and refused to have any contact with them: ‘‘So I wasn’t interested in the mother, father, what they do, where they are because I suppose I figure if they were doing the job right I wouldn’t be here’’. This perception did not change over time. Some young people had experienced very difficult situations in their lives for example illness and bereavement. Bigs were able to be understanding and to empathise, particularly those that had very similar experiences in their lives. They were also aware of not forcing the Little to approach the topic, but gave them the space and time to talk about it when they were ready. I would have been aware of it when I was younger too and I suppose because of my background and my upbringing and problems in my childhood, it would have been a lovely thing for me to have somebody that you could just spend a bit of one to one time with, away from your home and away from your school and away from all the other influences in your life. As the match developed over time, Bigs learnt to understand the needs of their Littles providing support, stability, encouragement and friendship; ‘‘So it’s just been (...) a nice kind of gentle progression. A normal friendship’’. 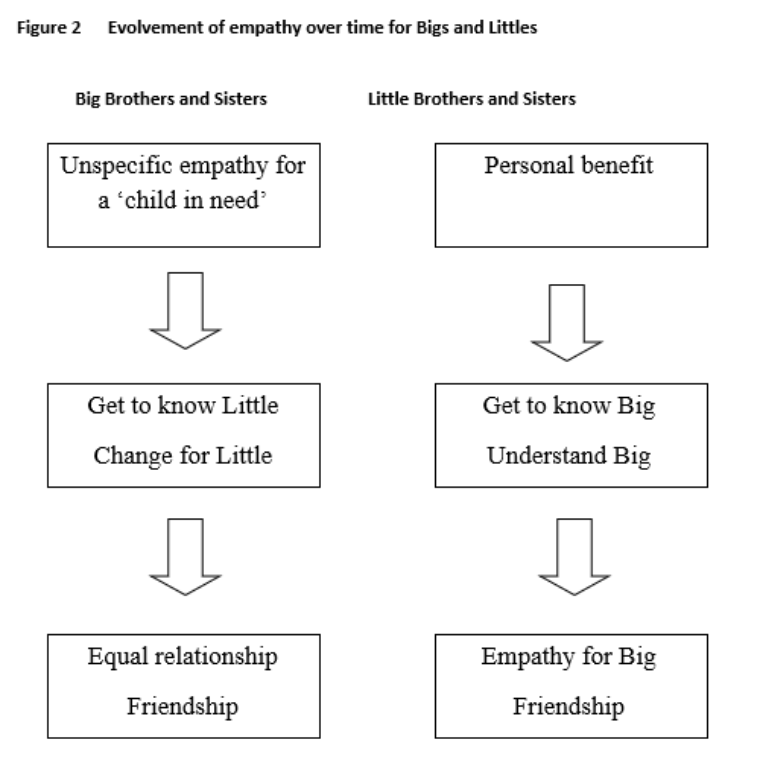 The role of empathy in mentoring relationships for Littles changed widely over time. This analysis found that empathy was not a motivation for Littles to engage in the programme, instead empathy was an outcome of their involvement in it. Littles were motivated to take part in the programme for the perceived benefits they thought they would obtain, including having someone to talk to and someone to meet outside their house. They also valued new experiences they had with the mentors; ‘‘I do stuff that I never thought I’d do before. Before we met I never knew (...) at a football club, I was never out there’’. Gradually, Littles began to get to know their mentors and build relationships: ‘‘I am getting to know him better(...)Yeah, it is good fun, you get new experiences, meet a new person, getting to know them’’. Littles began to describe their Big as a friend; ‘‘...he’s like one of my mates like, get on normal with him. He’s a normal guy; he’s like dead sound’’. Over time, young people realised that their Bigs were busy, and had their own lives and responsibilities which they were leaving aside to spend time with them: ‘‘I don’t know what days are suitable like, her husband works and she has to mind her kids’’. One Little Sister even spent time with Bigs’ younger children adapting to what they were going to, for example, ‘‘we watch it with her two girls; they are only young, so we would watch something for their age’’. This study found that empathy plays a crucial role in mentoring relationships, motivating Big Brothers and Sisters to engage with the programme, and adapt and listen to – as well as understand – their young mentees. The majority of Bigs in the study were empathetic and understanding towards their Littles, however there was one that expressed judgement over Little’s family. 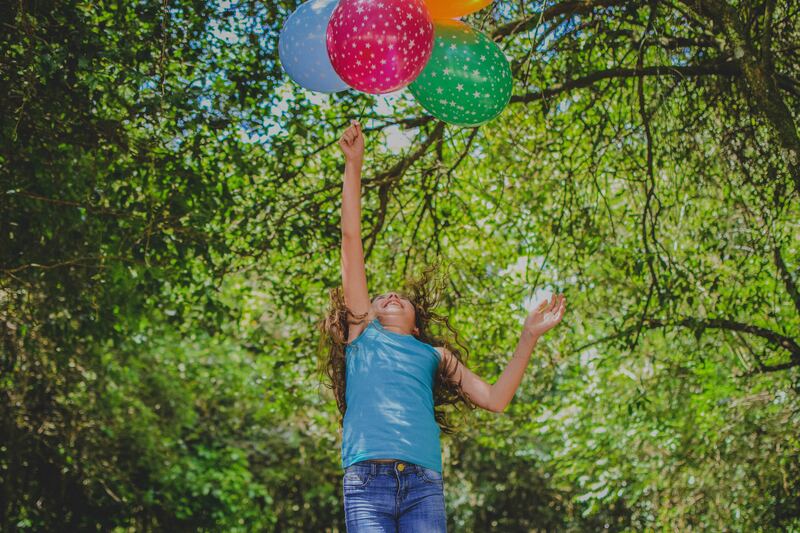 Previous research findings have found that judgement of the young person and/ or their family was associated with matches that ended prematurely because Bigs were not able to connect or understand the young person (Spencer, 2012). The beginning of the mentoring relationship can be characterised by challenges and uncertainties. Spencer (2012) suggested that mentors need to engage their mentees and respond to their needs and interests for the relationship to develop. Over time, mentors must adjust their expectations and get to know the capacities of their mentees. This research also identified a ‘balancing’ effect over time where the match becomes more ‘equal’. Mentors listened to their Littles' points of views by nurturing a horizontal relationship. Mentoring research has found that this collaboration between Bigs and Littles allows them to experience appropriate levels of power and control that can contribute to well-being, efficacy and competence in the young person (Spencer, 2012). Bigs and Littles referred to the match as a friendship that developed over time. Research has previously explored this suggesting that friendship can develop as personal or professional help (Gardiner, 1998). The underlying nature of mentoring relationships and professional friendships are not different as both include positive feelings, emotional intimacy, meeting relational needs and satisfying outcomes; however professional mentoring friendships are bound by a formal context (Gardiner, 1998). Describing mentoring as a friendship is relevant as previous research identified that ‘perspective taking’ empathy, the ability to cognitively understand other people’s internal states, was the primary predictor of friendship quality (Soenenes, Duriez, Vansteenkiste and Goossens, 2007). This may suggest why empathy is important in mentoring relationship and the quality of this ‘friendship’. Empathy is an outcome of their experience in the programme for young people. Littles had few expressions of active empathy at the beginning of the match, but empathy seemed to develop over time, as active empathy began to be directed at their mentor. According to Rumble, van Lange and Parks (2010) empathy-motivated help will occur if a person is able to perceive the need or distress in the other but also imagine their perspective. This may explain differences in empathy levels in young people. Other research studies have suggested that perspective-taking skills, such as empathy, require a certain level of self-perception that certain children may have developed more than others (Warden and Mackinnon, 2003). Previous research by Wagaman (2011) explained that young people ‘mirror’ emotions, body states and intentions of other people they observe or ‘tune into’ (p.286). This requires ability to distinguish self / other awareness, ability to regulate emotions and capacity to step into another person’s point of view. The findings of this research indicate that mentoring relationships can contribute to the development of empathy in young people. Empathy itself has benefits for young people including interpersonal competence, less aggressiveness, and improved friendships (Laible, Carlo and Roesch, 2004; Block-Lerner, Adair, Plumb, Rhatigan and Orsillo, 2007). Wagaman (2011) identified empathy as a crucial component of youth empowerment. This is particularly relevant for young people involved in mentoring programmes that have specific unmet needs as empathy and empowering can promote positive social change; ‘adolescents who are empowered are more likely to take action and exercise their power to transform social conditions’’ (Wagaman, 2011, p.285). The content analysis was limited by the length of the interviews; longer interviews would probably have more references than shorter ones. The original data did not specifically ask participants about empathy in mentoring therefore this content was inferred from the interviews during the secondary analysis. Block-Lerner J., Adair C., Plumb J., Rhatigan D. and Orsillo S. (2007) The case for mindfulness-based approaches in the cultivation of empathy: Does non-judgemental, present-moment awareness increase capacity for perspective-taking and empathic concern?, Journal of Marital and Family Therapy, Vol. 33 (4), pp.501-516. Cutrona, C. (1996) Social Support in Couples: Marriage as a Resource in Times of Stress. Sage Series on Close Relationships. London: SAGE Publications. Dolan P., Brady B., O’Regan C., Brumovska T., Canavan J. and Forkan C. (2010) Big Brother Big Sisters (BBBS) of Ireland: Evaluation Study. Report: Randomised Control Trial and Implementation Report. Galway: UNESCO Child and Family Research Centre. Eisenberg, N., and Fabes, R. A. (1998). Prosocial development. In W. Damon (Series Ed.) and N. Eisenberg (Vol. Ed. ), Handbook of child psychology: Social, emotional, and personality development. New York: Wiley, pp. 701-778. Elo S. and Kyngas H. (2008) The qualitative content analysis process, Journal of Advanced Nursing, Vol. 62 (1), pp.107-115. Gardiner C. (1998) Mentoring: Towards a professional friendship, Mentoring & Tutoring: Partnership in Learning, Vol. 6 (1-2), pp.77-84. Grossman JB. and Rhodes JE. (2002) The test of time: Predictors and effects of duration in youth mentoring programs, American Journal of Community Psychology Vol. 30, pp.199–206. Hsieh H. and Shannon S. (2005) Three approaches to qualitative content analysis, Qualitative Health Research, Vol. 15 (9), pp.1277-1288. Laible D., Carlo G. and Roesch S. (2004). Pathways to self-esteem in late adolescence: The role of parent and peer attachment, empathy and social behaviours, Journal of Adolescence Vol. 27, pp.703-716. Mayring P. (2000) Qualitative content analysis, Forum Qualitative Sozialforschung, Vol.1 (2), pp.1-7. Pamukcu B. and Meydan B. (2010) The role of empathic tendency and perceived social support in predicting loneliness levels of college students, Procedia Social and Behavioural Sciences, Vol. 5, pp.905-909. Rhodes J., Spencer R., Keller T., Liang B. and Noam G. (2006) A model for the influence of mentoring relationships on youth development, Journal of Community Psychology, Vol. 34 (6), pp.691-707. Rumble A., van Lange P and Parks, C (2010) The benefits of empathy: When empathy may sustain cooperation in social dilemmas, European Journal of Social Psychology, Vol. 40, pp.856-866. transmission of empathy-related responding in adolescence: The role of maternal support. PSPB, Vol. 33 (3), pp. 299-311. Spencer R. (2006) Understanding the mentoring process between adolescents and adults, Youth and Society, Vol. 37 (3), pp.287-315. Spencer R. (2012) A working model of mentors’ contributions to youth mentoring relationship quality: Insights from research on psychotherapy, Learning Landscapes, Vol. 5 (2), pp.295-312. Wagaman A. (2011) Social empathy as a framework for adolescent empowerment, Journal of Social Service Research, Vol. 37 (3), pp.278-293. Warden D. and Mackinnon S. (2003) Prosocial children, bullies and victims: An investigation of their sociometric status, empathy and social problem-solving strategies, British Journal of Developmental Psychology, Vol. 21, pp.367-385. Prof. Dolan is joint founder and Director of the UNESCO Child and Family Research Centre and Academic Director of the M.A. in Family Support Studies. He contributes to the undergraduate and postgraduate degree programmes of the School of Political Science and Sociology. Prof. Dolan holds the UNESCO Chair in Children, Youth and Civic Engagement. He has worked with and for families as a practitioner, service manager and academic for over 20 years. He has an extensive body of research on family issues. His major research interests are Civic Engagement, Youth Mentoring Models, Adolescent Resilience and Social Networks. Dr Bernadine Brady is a Lecturer at the School of Political Science & Sociology, NUI, Galway and a Senior Researcher with the UNESCO Child and Family Research Centre. Bernadine is a mixed methods researcher with a focus on social ecology and young people’s wellbeing, exploring how community, school, family and service provision influence outcomes for young people. Bernadine is currently Principal Investigator on an Irish Research Council funded study ‘Empathy, caring and connection among early adolescents’. Dr Cheikh is a research assistant at a National University of Ireland, Galway. He was awarded a PhD in Accountancy and Taxation from National University of Ireland, Galway and had accomplished a Masters in Finance from the University of Dundee. His research interests are in the area of ethical decision making and tax compliance behaviour.